ADMISSION: Admission is free to both of the bookend concerts. However, a limited number of VIP passes are available for a $95 donation. VIP ticket-holders will receive a free T-shirt, mug, admission to VIP tents at both stages June 9, food and cocktails supplied by local restaurants, meet-the-artist opportunities, and more. The tickets are offered as part of a fundraising initiative supporting year-round programming produced by RiverviewJazz.org. Clear your calendars, grab your lawn chairs, and get ready for some great music! Jersey City’s most prolific festival returns for its sixth year of world-class jazz in its annual week-long celebration this June. Enjoy food trucks, children’s activities, a record riot, local vendors, and hundreds of professional musicians throughout the week. 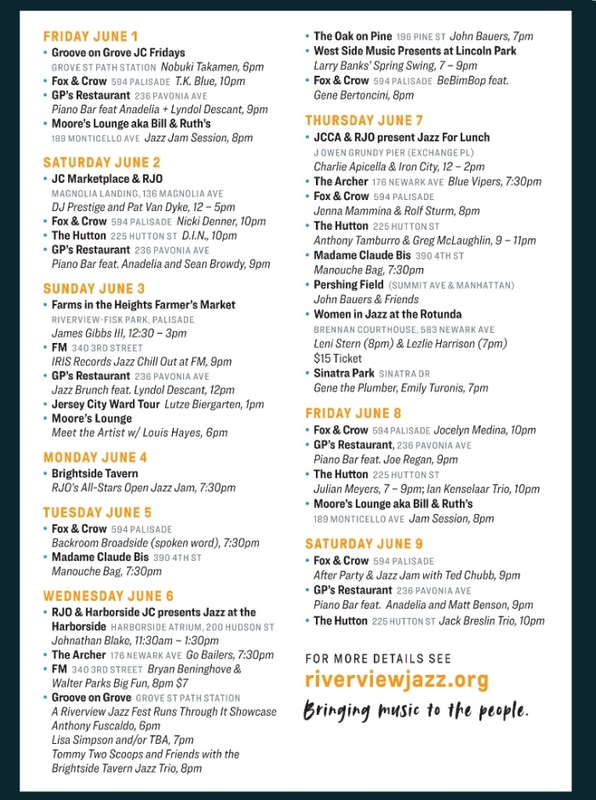 The sixth annual Riverview Jazz Festival will feature over 40 events, capped by two outdoor festival events June 1st and 9th. A new addition to the festival, the Riverview Kickoff Party sponsored by Exchange Place Alliance begins Friday, June 1, at 4:30pm on the Exchange Place J. Owen Grundy Park Pier. There will be a marching brass band led by Andrae Murchison, a ZT Amplifiers Artist Showcase featuring jazz guitar masters Dave Stryker, Vic Juris, and Charlie Apicella, the psycho-mambo band Gato Loco, and the salsa legend John “Dandy” Rodriguez’s Dream Team. In addition, there will be buskers galore honking away, DJ Prestige on the wax, food trucks, beer selections by Lutz Biergarten, and more! The event is free to the public. The closing festival on Saturday, June 9 from noon to 8pm will once again be held at Riverview Fisk Park in Jersey City Heights. New this year will be the Skyline Stage, a stage built on the hill overlooking the New York City skyline creating an amphitheater setting. Also new this year will be a Record Riot hosted by Iris Records, local vendors curated by Marketplace JC, and art activities hosted by 107 Bowers Gallery on the newly renovated gazebo. The lineup includes trumpet legend Wallace Roney, Doug Beavers Salsa Orchestra, Winard Harper & Tap Sensational (a tap dancing revue), Rob Curto’s Forró For All (Brazilian), the dynamic saxophonist Lakecia Benjamin and Soul Squad, organist Brian Charrette’s Kürrent, guitarist Walter Parks’ Spirituals Reimagined, and flutist Andrea Brachfield and Insight. Attendees of this free family-friendly event are encouraged to bring lawn chairs, participate in children’s activities, and enjoy the beer garden by Low-Fi. There will be another 40 events throughout the area at clubs and parks alike. Highlights from the week’s activities include​ Louis Hayes at the Moore’s Lounge Meet the Artist Series​ (Sunday 6/3). Drummer Louis Hayes has performed with everyone from Cannonball Adderly and Oscar Peterson to John Coltrane and Ravi Shankar. ​The Johnathan Blake Trio will perform the Jazz at Harborside Series (Wednesday, June 6, at 11:30am). Johnathan is one of the most in-demand drummers in town. He has performed with Tom Harrell, the Mingus Band, Kenny Barron Trio and many more. Also ​Wednesday, June 6, the Fox and Crow will host BeBimBop with special guest Gene Bertoncini.​ BeBimBop is a virtuoso acoustic instrumental trio featuring Brian Glassman, Joe Ravo, and Danny Mallon that can be seen at their weekly residency at the Morgan Library. Gene Bertoncini is one of the most pre-eminent jazz guitarists active today. He has been heard with Wayne Shorter, Benny Goodman, and Tony Bennett to name a few. ​Thursday, June 7, will feature ​“​Women in Jazz at the Rotunda” featuring vocalist Lezlie Harrison (7pm) and the Leni Stern Trio (8pm)​. The event will be held at the Brennan Courthouse on Newark Avenue and feature two of the most unique voices in jazz today. Tickets are $15. 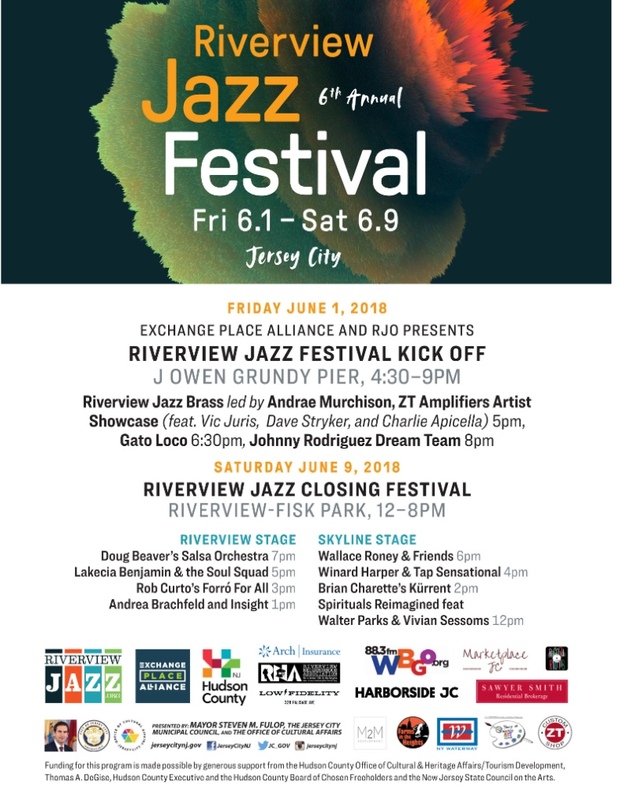 The Riverview Jazz Festival is made possible in part by Mayor Steven M. Fulop, the Jersey City Municipal Council, and the Office of Cultural Affairs. This program is also made possible by a grant from the New Jersey State Council on the Arts, a division of the Department of State, and administered by the Hudson County Office of Cultural & Heritage Affairs, Thomas A. DeGise, Hudson County Executive; and the Hudson County Board of Chosen Freeholders. RiverviewJazz.Org is a 501(c)(3) non-profit organization.